Aston Martin Racing’s Spa weekend has kicked off with a double pole position, with the #99 Vantage GTE taking the GTE Pro top spot and the #98 Vantage GTE leading the way in GTE Am. Aston Martin CEO Dr Andy Palmer is swapping his business suit for a race suit as he lines up alongside three fellow drivers to campaign a V8 Vantage GT4 in the forthcoming Dunlop Britcar 24hr Race, held at the world-famous Silverstone Circuit. 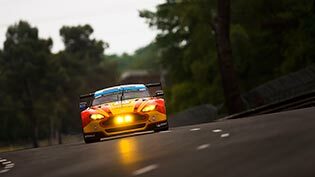 Aston Martin Racing (AMR) has won the GTE Am class of the FIA World Endurance Championship (WEC) Six Hours of Silverstone today (12 April) but narrowly missed out on a podium position in GTE Pro. Aston Martin Racing’s season started strongly at the opening round of the FIA World Endurance Championship (WEC) today (11 April) when it took the top three spots in qualifying for the Six Hours of Silverstone. Aston Martin Racing is looking to take maximum points at the opening round of the 2015 FIA World Endurance Championship (WEC), the Six Hours of Silverstone, this weekend (12 April) with its fleet of five Aston Martin V8 Vantage GTEs.